One if the biggest decisions you'll make in this life, aside from who you'll marry, is what you'll wear when you're marrying them. I speak to many brides and grooms at the shop and most ask for my opinion. Aside from telling them what my wife and I wore for our wedding (BTW, we looked awesome) and aside from telling them what is popular among the masses, I usually advise the betrothed to do some research of their own. There's tons of info out there, in all forms: magazines, websites, blogs, books, mother-in-laws, etc. Well, now there's an app for it too. 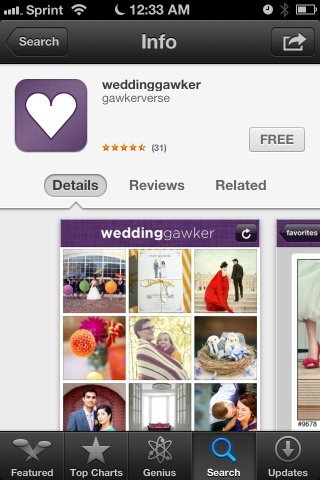 Check out this iphone app I stumbled across last night, it's called Weddinggawker. The point is, there are so many looks and ideas out there and it's your wedding so you should dress how you want. Get some good ideas, put your own spin on it. Tell your tailor exactly what you want. And guys, if you don't decide what you want to wear then she'll decide for you, and we all know how that can end up. Now that that's settled, you can get on to the third most important thing, writing your vows! Valentino Tailors is a full service alterations and repair tailoring shop. We also sell fine men's clothing and provide formal wear rentals for special occasions. Family run since 1969, customer service is the most important product we sell. The purpose of this blog is to help educate our customers, promote the good we see in the clothing industry and help give a voice to a sometimes quiet industry.